The Happy Lady card is the gift that will have her tickled pink! What is the Happy Lady card? It’s catching a crisp salad, or a creamy slice of Cheesecake with the family at The Cheesecake Factory. It’s shopping for the most fabulous new clothes, shoes and accessories at Lord & Taylor and Saks Fifth Avenue OFF 5TH. It’s picking out something new for the home at Bed Bath & Beyond or relaxing at the spa with Spafinder. 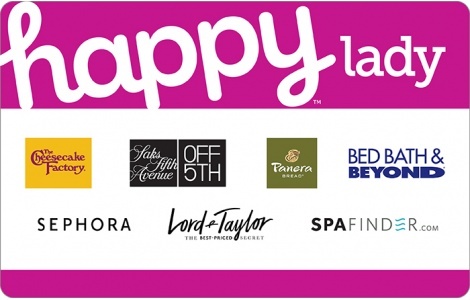 The Happy Lady card is the perfect gift experience for any of the wonderful women in your life!